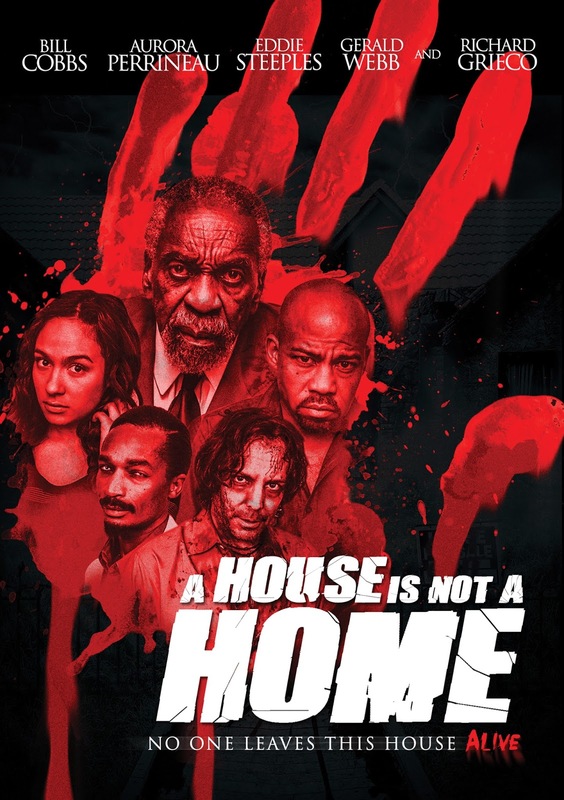 A House Is Not a Home is an award winning horror (best horror feature at the Burbank International Film Festival among others) directed by Christopher Ray (Two-Headed Shark Attack, Mega Shark vs. Crocosaurus) that after a limited theatrical release is going to be coming to DVD and digital platforms later this month. It is a haunted house film that despite seeming quite low budget still has some genuinely good ideas going for it. This is not the best movie in the world, I admit at times I laughed at the silliness of it all, but this is not at all a boring film, I had a lot of fun watching this, while what is happening isn't scary it is at least consistent with not much downtime between the scenes, there didn't seem to be much filler at all. The entire film takes place in this largish feeling house, I guess this was to save on budget. In general the house seems very basic with modest furnishings making it seem like somewhere not really lived in. There is liberal use of a smoke machine to make later goings on seem more sinister, and it does add to it but A House Is Not a Home never seemed to shake the 'made for TV' vibe I was getting off of it. The quality of the camera and the films score both seem adequate but really nothing stood out for me. From what started out as pretty basic this actually has some really fun ideas, it throws a few curve balls that admittedly it struggles to convey but made the whole concept feel fresh. The horror comes in many forms, there are a few jump scares that feature close ups of messed up ghosts (gore and contact lenses used to make them unsettling), creepy looking china dolls that move (yes, actually move which makes them far better than Annabelle), random loud noises from other places in the house, and even a demonic being. My favourite was a recurring shadow monster, I just could not work out if it look awful or fantastic, but I found it really clever how it appeared on screen, probably a fun highlight for me when it attacked daughter Ashley. This has quite a small cast but all do fine enough jobs, the tension between Ben and Linda is obvious from the offset, small details like Ben sleeping in a separate bed and Linda being an alcoholic add to the mystery of what has happened in their past. Both Webb and Nicole Baxter in this respect are great. Stand out character for me was Bill Cobbs as the real estate agent, he only has a small role but he stole every scene he was in and appears in some of the more weirder parts of the film. The Hoodoo priest was also a pretty interesting character. This movie cannot be criticised for not featuring a diverse group of actors also, refreshingly having nearly an all black cast. Sure at times the characters have that weird film logic of not seeming to care when traumatic things happen, and there are plot elements that left me baffled, but when Webb is sliding all over the house as he runs around I can't help but forgive some of that silliness. The editing and camera work is at times ingenious. It starts off in the best way with a seemingly unrelated character meeting his end, then in a twist later on a scene happens that is nearly a shot for shot recreation, it flips between the footage of this guy and of footage from later on in the film and looks pretty special as a result. There are also two separate cases of fourth wall breaking which I really loved, the one which ends the film in particular was awesome. For what is a limited set a lot is achieved to make it seem bigger than it actually is. I would say A House Is Not a Home isn't going to win any awards but it already has, instead I will say that despite punching above it's weight this is a fun horror film that does a lot and succeeds in giving the viewer an enjoyable experience. A House Is Not a Home is out on DVD and on digital 27th September thanks to the MVD Entertainment Group and can be ordered from the MVD shop or Amazon. Check out the trailer below and see what you think.